To see their personalized ceremony, click here. ​​Shari led us through pre-marital couples counseling and marriage planning with close attention and patience. Utilizing the PREPARE/ENRICH curriculum, Shari helped us learn and grow with each other (even when we thought we knew everything!). She gave us the opportunity to talk through our wishes and fears and articulate our reflections on how our upbringings and personalities affected each other and our relationship. Only with this dedicated space and time were these incredible pre-marital conversations able to emerge. Additionally, Shari helped us incorporate a variety of meaningful additions into our ceremony that reflected our cultural backgrounds. Most important and delicate of these additions was figuring out a way to incorporate our desire to recognize our different racial backgrounds and the significance of our union. Over the course of several discussions, Shari guided us to an option with which we were very comfortable, and the language she crafted nodded to our support for marriage equality as well. On the day of our wedding and throughout the ceremony, Shari created a calm atmosphere for us, our family, and all of our guests. Her preparation for our ceremony was clear, and the way that she read her portions of our meaningful ceremony was heartfelt with a practiced pacing. 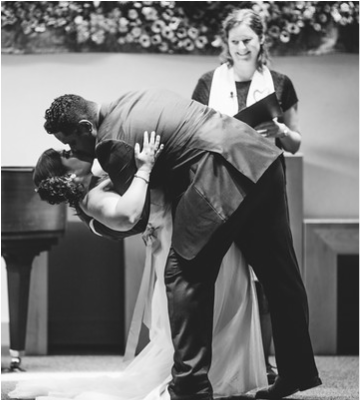 As our ceremony spilled into spontaneous laughter and dissolved into choked up tears and cycled back into laughter, Shari supported our ownership of those feelings and the natural flow of many emotions throughout the ceremony. We are so grateful to Shari for contributing to the foundation of our marriage. We had the pleasure of working with Shari Woodbury for our wedding in July. At our first meeting over a patchy internet connection via Skype back in April, Shari immediately put us at ease with her warmth, professionalism, and sense of humor. Coming from different faith backgrounds, we wanted a personalized ceremony that would also be meaningful and familiar for both our families. 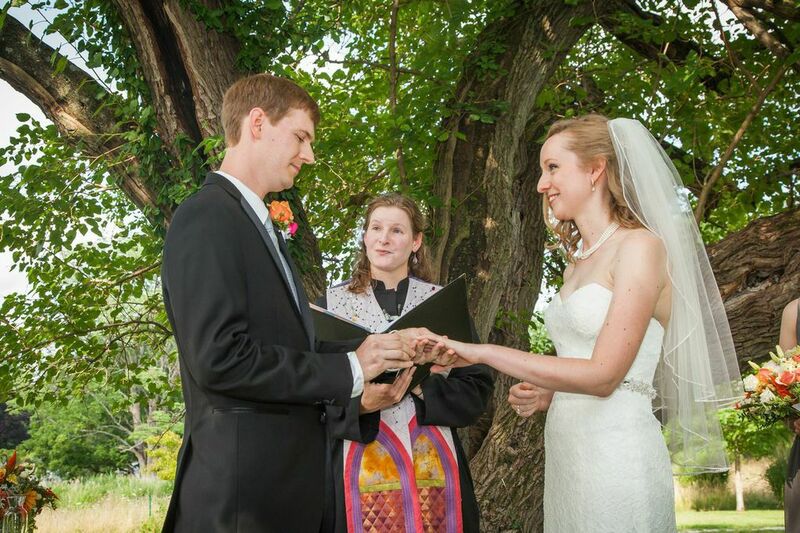 Shari listened to our preferences and worked with us to create a personalized ceremony that exceeded our expectations. We couldn’t have been happier with the ceremony, which was, for us, just the right balance of spiritual and secular, traditional and unique. In addition to planning the ceremony itself, Shari provided valuable premarital counseling that helped us strengthen our relationship in the months before our wedding day. It was obvious that she genuinely cared about our success as a couple. We had fruitful discussions stemming from the personality test and reading materials she recommended, and we will continue to use the communication tools she showed us throughout our married life. We attended several premarital counseling sessions with Shari. 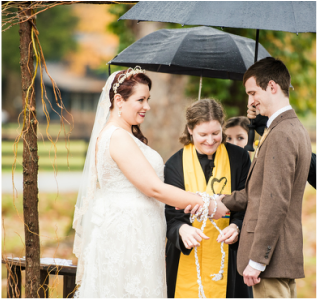 During our meetings, she guided us through the PREPARE/ENRICH materials, and she helped us customize our ceremony. She encouraged us to openly discuss issues that we may not have addressed on our own. Our time with her was immeasurably valuable in the weeks leading up to our wedding. Shari attended our rehearsal the day before the wedding, and she patiently guided our family through the processional and rituals. 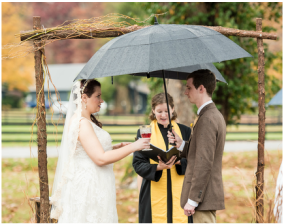 On the day of the wedding, she stood in the rain with us to perform the ceremony. She didn't complain or bat an eye. 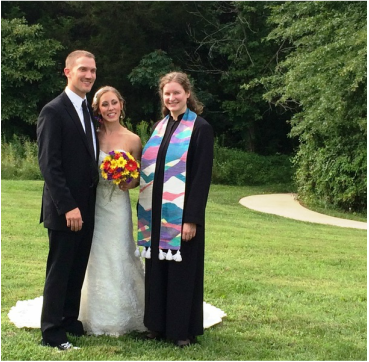 Since nature was such an important part of the ceremony, her selflessness meant a lot to us. She was a very calming and balancing presence. Every guest was moved and impressed with the ceremony that Shari helped us build. Weeks later, we're still receiving compliments about its unique beauty. She took the time to know us, listen to us, and empower us to make it our own. The ceremony was far and away our favorite part of the wedding, and we know that it's mostly thanks to Shari's willingness to create something special for us. Click here for a pdf of this ceremony. I am a certified PREPARE/ENRICH facilitator. This is the leading program clergy and therapists use for premarital counseling and marital enrichment. PREPARE/ENRICH includes a relationship inventory and series of customizable materials for helping couples explore key issues and build a strong foundation for their marriage. Based on the couple, I bring other resources into counseling sessions as well. ​Planning our wedding brought the expected emotions; joy, excitement, stress, and anticipation marked our year of planning. Working with Shari in premarital counseling and wedding planning added clarity and calm to the months leading up to our wedding. In our counseling sessions, Shari was flexible in allowing our needs to direct the conversation. Shari provided thoughtful feedback and helped us to identify areas of strength and growth. Her calm, thoughtful demeanor put us both at ease. 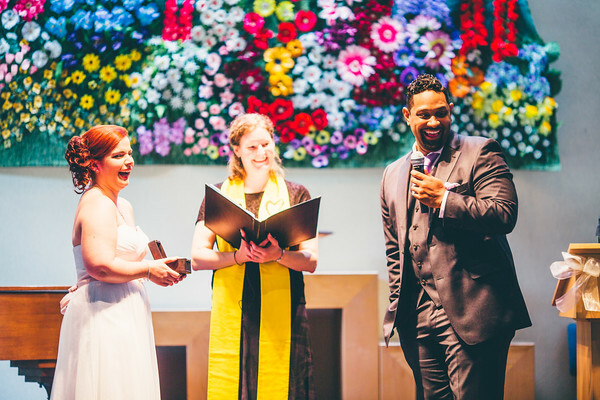 When it came to planning our wedding ceremony, Shari made it clear that the goal was for the ceremony to be a reflection of our relationship, values, and personalities. She offered suggestions, but was incredibly flexible when it came to deciding what to include in the ceremony. The result was a ceremony more meaningful than we could have imagined. Shari is a strong grounding force who approaches her work with organization, dedication, and grace. We were incredibly fortunate to work with her! A note about photographs: the pictures on this page, as well as others of people on this site, are used with permission.